The 2004 Pichon Lalande is a strong effort for the vintage (much better than their underwhelming and much more expensive 2005). A blend of 53% Cabernet Sauvignon, 36% Merlot, and the rest Cabernet Franc and Petit Verdot, it exhibits a deep ruby/purple color as well as scents of cocoa, espresso roast, black cherries, and cassis. Medium to full-bodied, opulent, and fleshy, this classic wine cuts a stylistic persona somewhere between the 1995 and 1996. It can be drunk now or cellared for two decades. Tasted at Bordeaux Index annual 10-year on tasting from an ex-château bottle. 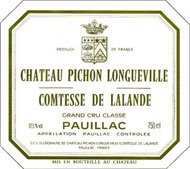 The Pichon-Lalande 2004 has plenty of dark plum and blackberry fruit on the nose, a little higher-toned than its peers with just a hint of star anis and dried fig. The palate is supple on the entry with succulent ripe blackcurrant and raspberry fruit, touches of white pepper and graphite. This is fresh and vibrant, something almost like a classic Napa valley Cabernet about this wine. Lovely, so much so that I cannot recommend cellaring it for much longer! Tasted March 2014.